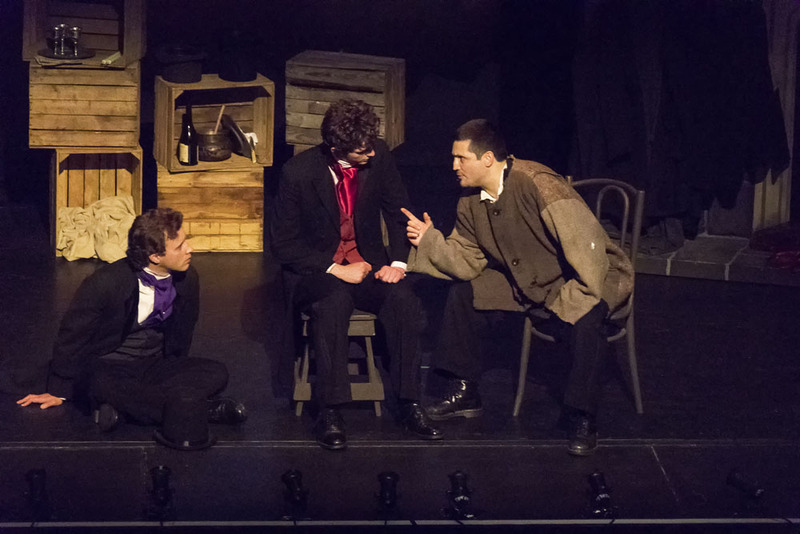 Despite his lack of formal education, Charles Dickens is one of our most celebrated authors, so it is unsurprising that his works are often chosen to adapt for the stage and screen. Some of the adaptations have been sensational, others quickly forgotten. Director Sarah Russel chose very carefully in using the Gale Childs Daly version of this particular classic. 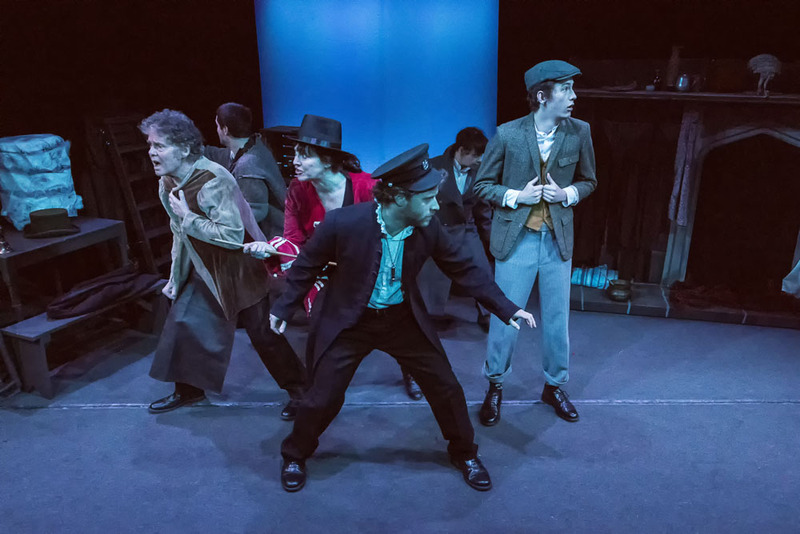 When it comes to creating memorable fictional characters, Dickens is one of the masters, and this production contains a whole host of them. 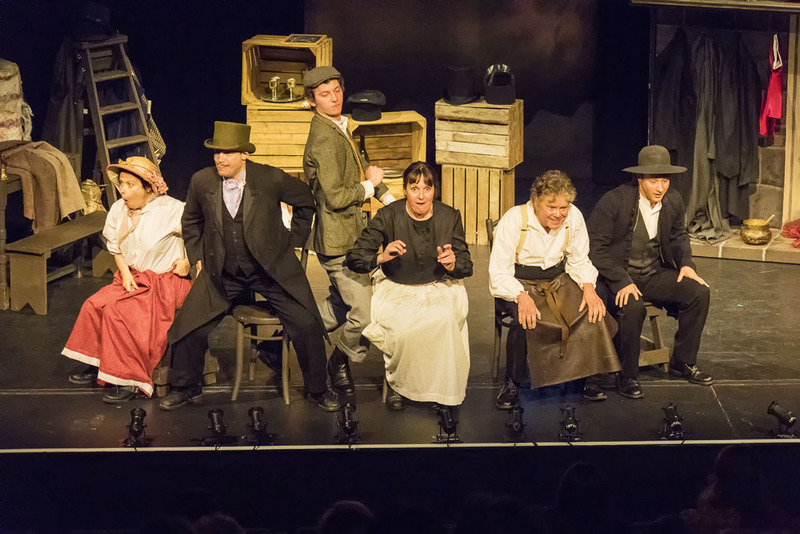 The programme notes claim there are 30 characters in the show – although it felt like more – but they are played capitally by just six performers. Having a small cast but a large number of characters can often pose a massive challenge for a director, but in this case, Sarah has done a good job and has brought some beautiful creative and concrete touches to the story. 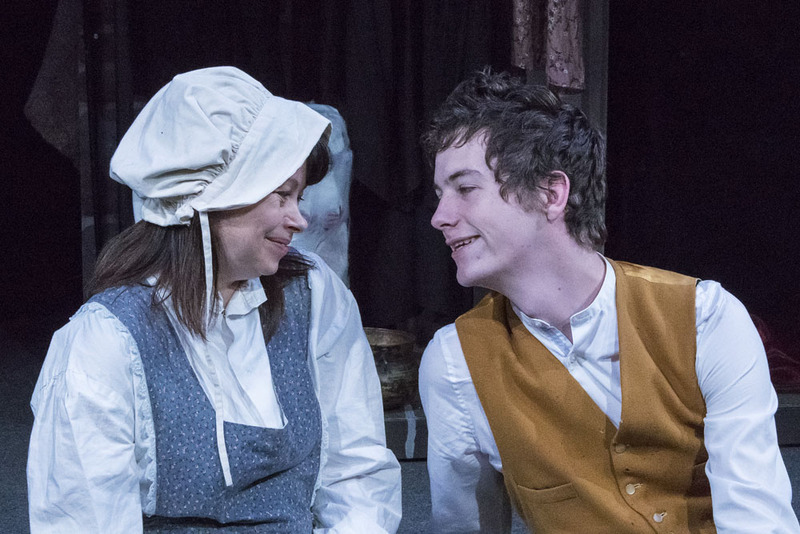 Great Expectations depicts the personal growth and development of an orphan nicknamed Pip. The show opens in a graveyard, with the seven-year-old Pip being threatened by Magwitch the convict. The frightened boy obeys the escaped prisoner’s demands, without knowing the positive consequences it will have. 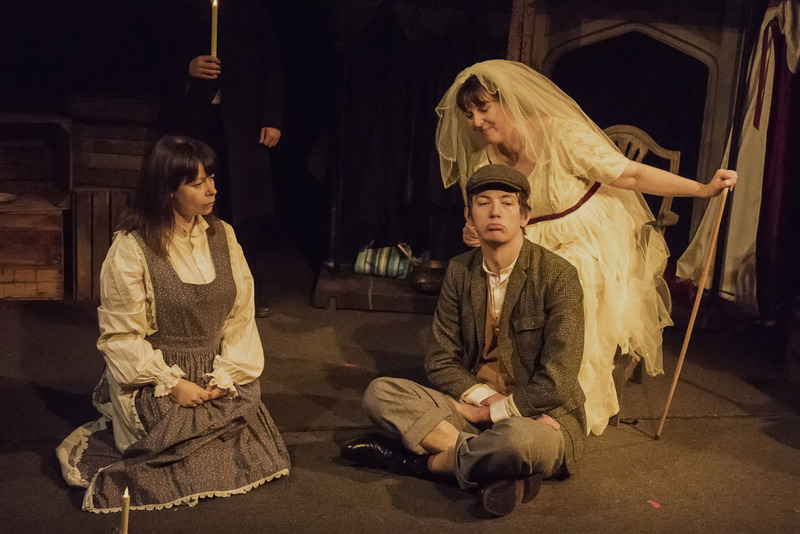 As Pip grows up, he encounters the deserted bride, Miss Haversham, falls in love with her ward, Estelle, and is spirited away to London where he enjoys the life of a gentleman before Magwitch re-appears to shake Pip’s life one more time. Staged in the Maskers Studio, the play is very intimate, which works well since the script is mostly narrated by the various characters. On the other hand, this is at times difficult to follow as the narration bounces from character to character. Also, Great Expectations is one of only two of Dickens’s novels to be written in the first person, but this version has removed that quality, delivering much of the text in the third person. The central character, Pip, is played expertly by James Fairley. It is not always easy to portray the gradual ageing of a character, particular when starting at the tender age of seven, but James does so brilliantly. The remaining five actors are then challenged with seamlessly morphing in and out of the various characters and to keep the action flowing. Matt Avery delivers some brilliant characterisations, from the dark and mysterious Magwitch, through the pompous Pumblechook, to the sly but competent lawyer, Jaggers. Calum Daly brings lovely comedic qualities to his roles of Herbert Pocket and Mr Wopsle. Jo Barnard’s portrayal of both the begrudging sister, Mrs Joe, and the cold-hearted Miss Haversham are both powerful and poignant. Sarah-Jayne Wareham’s characters are wide-ranging but all beautifully convincing, from the spoilt Estelle to the shady and menacing Compeyson and the plain and cheerful Biddy. Finally, Eric Petterson gives delightful depictions of the happy but simple Joe Gargery, the calm and composed Mr Wemmick and the snobby Bentley Drummle. Emma James’s set design is well used, and most of the costumes are hung around the scenery to aid the actors with their quick changes. On the whole, those costumes are excellent, given that the piece is set in the early 19th century, but with so many different parts being played, at times it was a little confusing to tell if an actor was in the right costume at the right time! 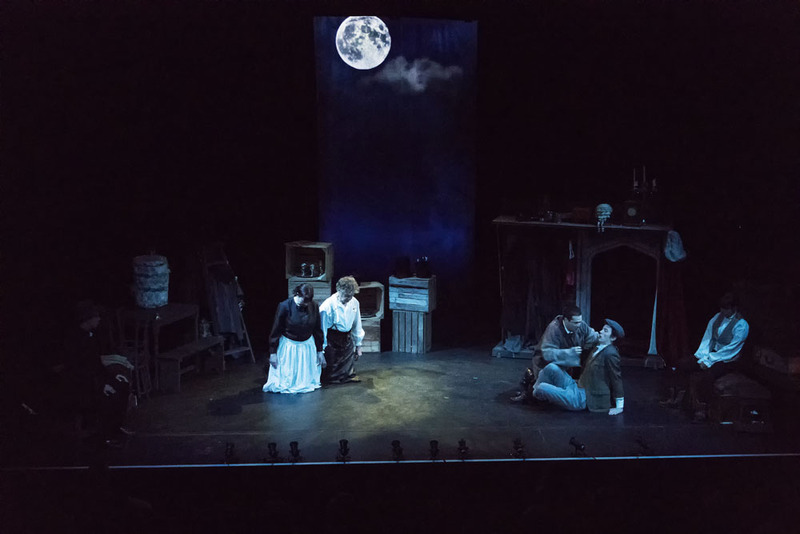 Clive Weeks’s lighting design beautifully complements both set and action, greatly enhancing the necessary changes in atmosphere of the play. It was good to see the actors also re-creating some of the audible effects to the action, rather than simply having pre-recorded sound. 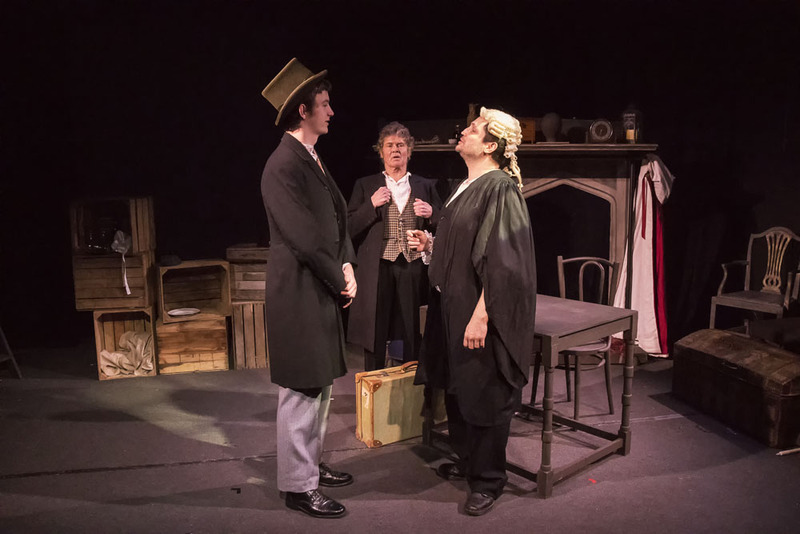 All in all, a very good adaptation of this classic, which can be seen at the Maskers Studio until Saturday 1 April, and then at the larger but less intimate Berry Theatre from 4 to 8 April at 7.30 each day. 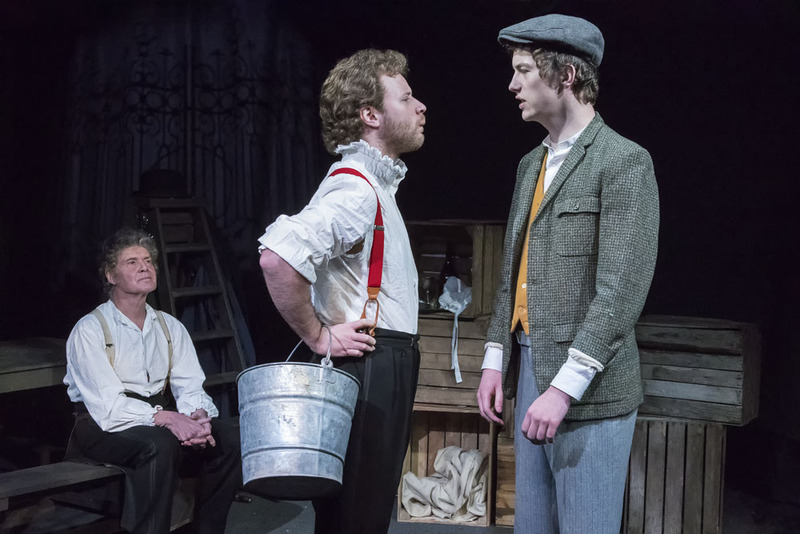 First time Director Sarah Russell brings new energy to Dickens' novel, in this first UK production of Gale Childs Daly's stage adaptation, which, with just six players, preserves the plot, most of the characters and a great deal of the author's original language. Quick changes, atmospheric use of the actors as chorus, subtle set and lighting design (by Emma James and Clive Weeks), and Wayne Landen's unobtrusive but effective music keep us focussed on the story, as it proceeds to its exciting and touching conclusion. 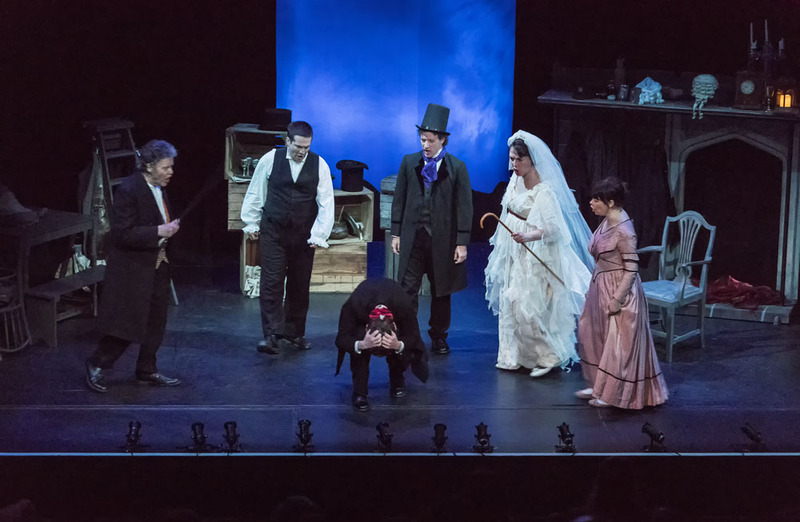 This ensemble piece includes three debuts for Maskers – James Fairley, making the timid boy Pip into a rueful, wiser man, Calum Daly, delightful as Herbert Pocket and ham actor Wopsle, and Jo Barnard, creating three distinct characters as Molly, Mrs Joe and sad, cruel Miss Havisham – while Matt Avery, Eric Petterson and Sarah-Jayne Wareham make valuable contributions, the latter especially memorable as Estella. I had my own ‘Great Expectations’ of this production, having heard from several sources just how good it was, and I wasn’t disappointed. In her directing debut, Sarah Russell has chosen well. 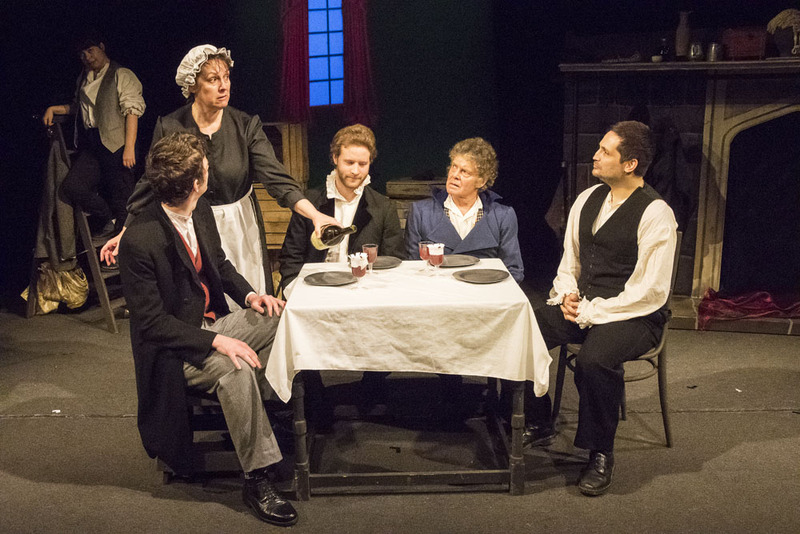 Not only is this one of the cleverest and most faithful stage adaptations of an oh-so-classic Dickens favourite – but her choice of cast who work as a good ensemble should, as a well-drilled team, is excellent. There is no weak link to spoil the fast, almost furious pace or the rollercoaster ride of tension, atmosphere and emotion as we journey with Pip from his first frightening encounter as a child in the graveyard, through his manipulated transformation to London gentleman and the realisation that his benefactor wasn’t who he thought it was, to the final, bitter-sweet conclusion. What makes this adaptation by Gale Childs Daly so intriguing is that well over 30 characters and five narrators are played by just six actors, seamlessly moving from character to character with confidence. 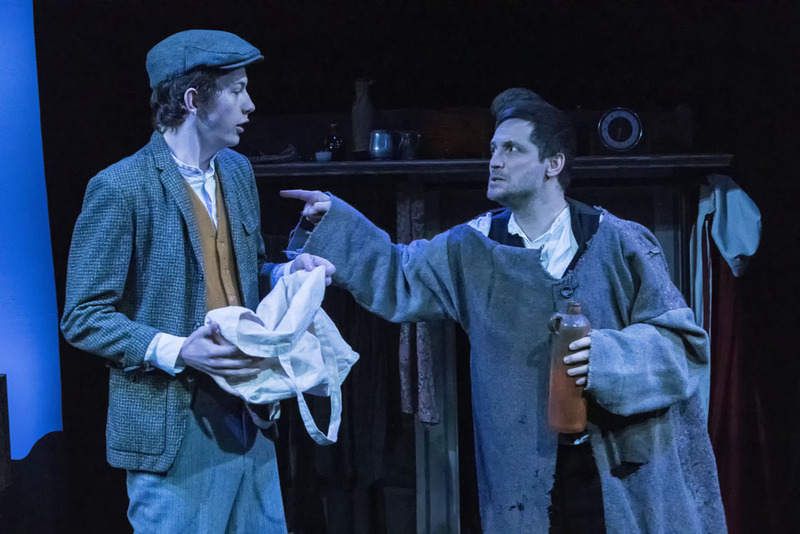 Pip, our central character, is played with great emotion throughout by newcomer James Fairley, who also manages to subtly change his voice from young Pip to older Pip to narrator. All other roles are played by the remaining five cast: Matt Avery is superb in the dual roles of villain Magwitch and lawyer Jaggers, swaggering and staggering his way through these and other characters with consummate ease. Likewise Sarah-Jayne Wareham, who seems to have succeeded in her ambition to get a duck onto the stage at some point, brings energy and dynamism to the multiple characters of Estella, the dreadful Miss Havisham’s unfortunate ward, Biddy (Pip’s childhood soulmate) and numerous other supporting roles. There are also solid characterisations and performances by Jo Barnard as horrible Mrs Joe, sad old Miss Havisham and Molly; Calum Daly who brings to life funny little Herbert Pocket and Mr Wopsle who, in turn, does his own turn as a wonderfully hammed up Hamlet; Eric Petterson completes the ensemble perfectly as dear old Joe Gargery, the blacksmith, Mr Wemmick and the odious Bentley Drummle. 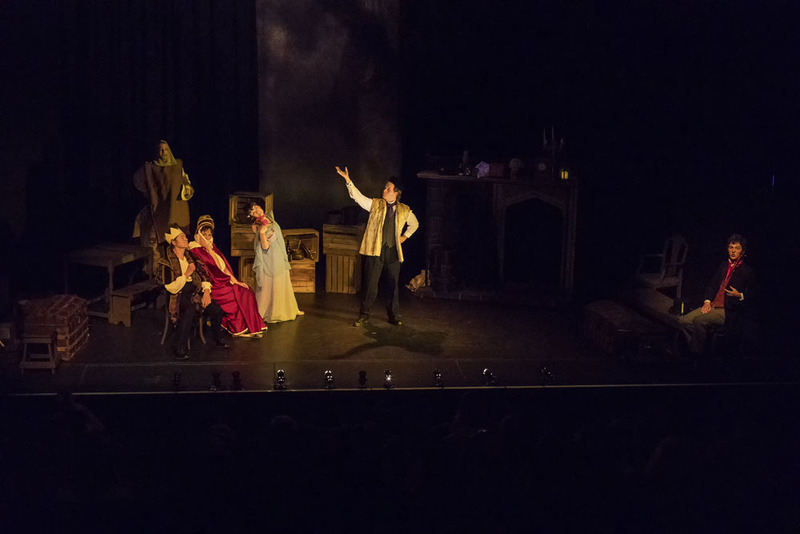 Great Expectations And that’s not to mention all the other soldiers, waiters, coachmen, villains, ghosts, narrators and the other hapless cast members of the play within the play, Hamlet – so authentically caricatured by strategically positioned footlights. No less than 35 scenes are separated by effective lighting plots (designer Clive Weeks), helped by a simple but well crafted set design by Emma James and minimal props and furniture, and those scenes come and go at a cracking pace. Never is there an awkward pause whilst waiting for something to happen, yet the light and shade between the moods of some scenes is there, and works well. There is comedy, even slapstick, there is drama and suspense. Granted, much of this already exists in Dickens’ story, but Sarah Russell has been quick to capitalise on clever writing and a superb script which remains faithful from start to finish. I think Mr Dickens would approve of this version, even if it is narrated in the third person, unlike the original novel which was Pip’s own narrative. Was there anything missing? Well, I’m not a great fan of the over-use of dry ice or smoke but perhaps in the opening, eerie graveyard scene and the foggy, watery wastes of the Thames estuary near the end, it might have helped to enhance that Dickensian, swirling atmosphere, although in all honesty it didn’t really need it. 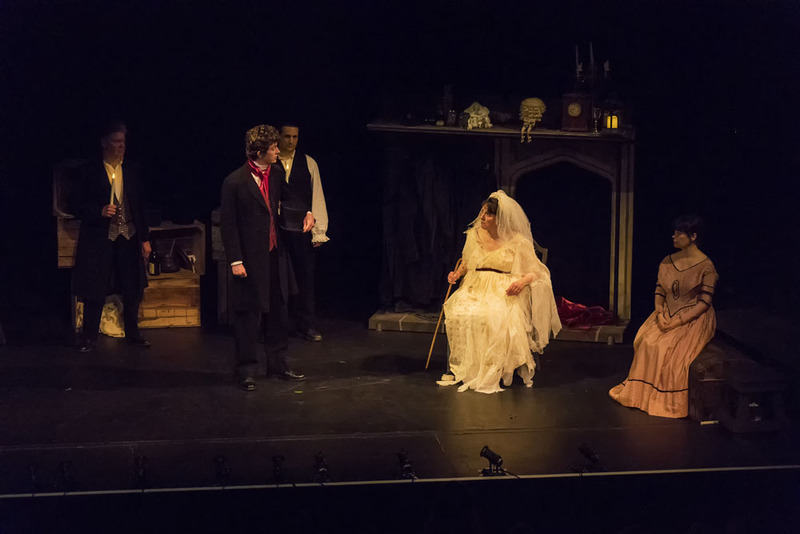 A word about the venue: last week Great Expectations played to full houses at Maskers’ own studio in Southampton which I am sure was rather intimate, given the size and scale of the production. This week, and as something of a try-out I am told, Maskers chose The Berry Theatre for its second week. What a great choice – I think it is just perfect for not only this particular production but for many of the Maskers shows I have seen over the years at The Nuffield. The Berry is small enough to still be intimate, yet large enough to accommodate larger audiences and productions. It’s easy to get to, parking is no problem and everything about the theatre is clean, professional and inviting. I do hope I will have the pleasure of coming to see more theatre here, and that Maskers will return. It’s made for them. Amazingly there are still tickets available so if you are a Charles Dickens fan, you fancy being well entertained and want a slightly different night out, get yours before the run finishes this Saturday. "Went to see Great Expectations last night. What a clever production! Great acting and direction. Brilliant staging, costumes and use of props! Well done all." - M.B. "Saw Great Expectations tonight, what a wonderful production. Congratulations to all involved." - K.M. 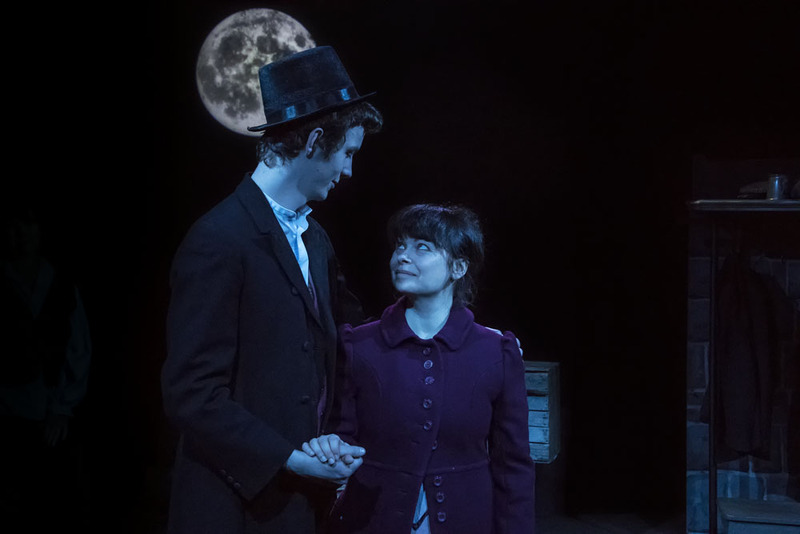 "Just seen Maskers Theatre Company perform Great Expectations at The Berry Theatre. Absolutely cracking production, reminds me of why I am proud to be a Masker. Six actors take on all the roles using clever costume changes and moving around onstage props and suggestions of set to define the different scenes and characters (I would love to be a fly on the wall backstage - it must be carnage!). The result is a fast paced, modern adaptation of a story which I have never quite followed before" - J.W. "Everyone totally committed to their various characters and the energy didn't slip for a single moment! Thoroughly enjoyed ourselves. This is the best way for someone studying the novel to get across the main threads of Pip's story." - R.K.
"A brilliant show. DO NOT miss it! I don't know how this handful of actors played so many parts so convincingly and to remember not only lines but all the scene and costume changes." - L.A.
"Had a fabulous evening's entertainment watching "Great Expectations" at The Berry Theatre Great production and lovely venue" - S.L. "What Larks, Pip! What Larks!" Great Expectations is one of Charles Dickens' most popular and well-known novels. Full of memorable characters and fast-paced action, Gale Childs Daly has created a powerful and moving script to tell this epic story in a way that appeals to audiences young and old. By turns dramatic, frightening, and dark, yet full of pathos and humour, we follow young Pip as his life undergoes a dramatic transformation of the kind many wish for - but he soon learns that money isn't everything. Early on, Pip meets the eccentric but haggard character Miss Havisham, jilted at the altar years ago and living in the ruins of her wedding feast, surrounded by decaying food and still wearing her wedding dress. He falls in love with Miss Havisham's adopted daughter Estella, and longs to become a gentleman in order to win her over and better himself. With themes of love, loss, poverty, money, power, and loyalty, the story of Great Expectations resonates powerfully in the 21st century. 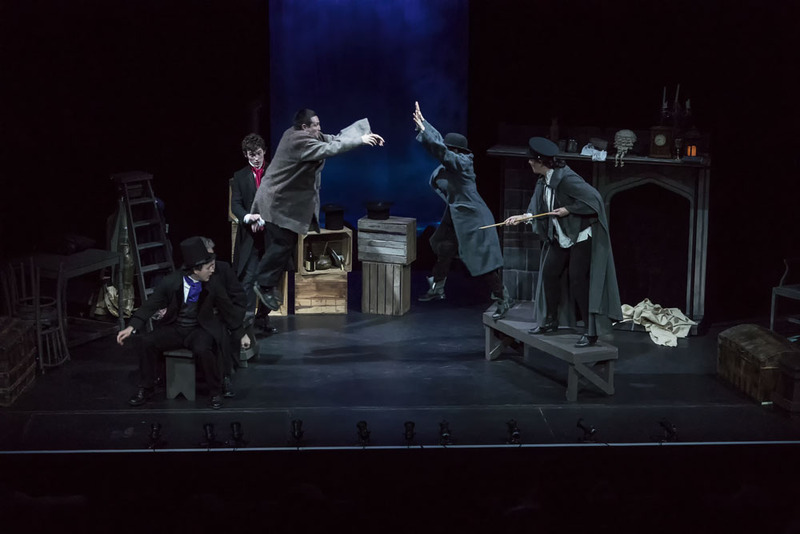 This Maskers production uses exciting physical theatre, haunting lighting, clever costumes, and original soundscapes composed especially for the show by a local musician, to build the atmosphere of what Dickens himself called his "very fine, new, and grotesque idea". Sarah has been a Masker now for over 12 years and during that time has appeared in many productions including Pygmalion, The Graduate, Butterfly Kiss and Man in the Iron Mask. She can also be found working behind the scenes as a member of the busy marketing team. This is Sarah's first outing as director and she is very much looking forward to bringing this Dickens classic to the stage and is excited to be working with such a talented cast and crew. James is looking forward to appearing in his first ever production with Maskers. 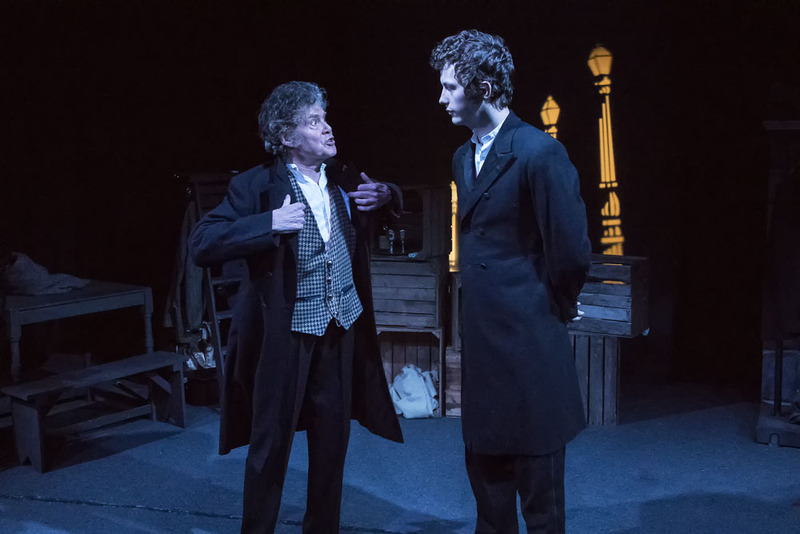 Currently studying History at Southampton University, he was previously a member of Applause Youth Theatre in Dorking, where his greatest stage memory is receiving a standing ovation from Sir Michael Caine at the Leatherhead Festival. His previous roles include 'Jack' in Vinegar Tom, 'Laurence' in Abigail's Party and 'Haemon' in Antigone. James is very excited to be working with a great crew and cast in bringing this classic to life; and is looking forward to many more productions with this fantastic company. Matt is delighted to have been cast in this show for which he has - what’s the expression? High anticipation? Large predictions? Enormous assumptions? Among other characters, Matt is playing a dark and brooding villain with murderous intent - so, typecast again! Calum is a new Masker and is anything but quiet! As a child, he attended the Saturday school 'Stagecoach' for young performers. His enthusiasm drove him into earning a college degree in performance. After being away from performing for a number of years, he is looking to dust off his diploma and be under a spotlight once again with a supporting, hard-working and creative cast and director. Jo simply loves Great Expectations because she studied it for O-Level with an inspirational English teacher (thank you Mrs Joan Ritchie!). While this is Jo’s first production with the Maskers she felt right at home with us from the start, having seen so many of our shows in the past. Jo is also an acting member of both RAODS and Southampton Operatic Society and finds her amdram life an exciting change from her day job as a freelance marketing copywriter. SJ has appeared in a number of productions for the Maskers Theatre Company, including Mrs Robinson in the Graduate; Mercy in Humble Boy; and Valerie in The Weir. She recently appeared in God of Carnage at the Chesil Theatre. SJ is determined to get a duck into this show...Dickens would approve. Eric Petterson started a late acting and singing career in A Christmas Charivari in 2012. He performed in several subsequent Christmas shows and his straight acting rôles included the guard in Forward to the Right, and Jack in The Weir. He played Gaunt in a touring version of Richard II and enjoyed picking up young ladies in The Yalta Game. He is very much enjoying Great Expectations and has fond memories of the Berry theatre. Each of the Narrators played 6-8 characters each, including those listed.